Luxury and practicality are nearly always mutually-exclusive. With the sports sedan class, they become much closer to one another. This class empowers drivers to get behind the wheel of a car that appeals to both heart and mind, the heart with decadent features like standard leather heated seats, heart-racing thrill and a sensual aesthetic and the mind with a large amount of cargo space and sensible driver-focused technology. Cars in this class must offer top style, massive performance and interior comfort and convenience that surpasses more practical sedans. The 2018 Kia Stinger is one of the most surprising and acclaimed models on the market. In its inaugural year, it’s already taken home awards for reliability and performance. In our exclusive comparison, it goes up against the 2018 Mercedes-Benz E-Class line of executive sedans. This class gives drivers German performance with a focus on extravagant interiors. 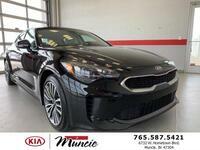 Shop our entire Kia Stinger inventory now! The 2018 Kia Stinger manages to best the Mercedes-Benz E-Class in every metric for which drivers choose the class. The Stinger is faster, handles better and offers a more premium interior experience than the 2018 Mercedes-Benz E-Class. Here at Kia of Muncie, we believe that if you’re paying $50,000 for a luxury sports car, you shouldn’t be sitting on plastic. From its base model up through the top-trimmed GT2, the 2018 Kia Stinger provides value. Heated seats are a standard feature on every single 2018 Kia Stinger sold. The 2018 E-Class requires either an upgrade to the E 400 or a costly package addition to take advantage of this feature that becomes a better investment every passing winter. The aesthetic seems to reveal different priorities for the two models. For Mercedes-Benz, it’s cutting a staid and static profile that falls in line with their classic luxury reputation. As a newcomer, the 2018 Kia Stinger is a more dynamically-designed vehicle featuring aggressive accents and sweeping exterior lines. This emphasis on sport is especially apparent in the 2018 Kia Stinger’s performance edge over the E-Class. The base model Kia Stinger enjoys more power and speed, while the twin-turbo V6 blasts the adjacent engine from Mercedes-Benz out of the water by over 30 horsepower and over a half a second less accelerating from to 60 mph from a dead stop. You may think that these advantages are reflected in the price, but the opposite is true. Mercedes-Benz has made sure their buyers are primarily looking for the silver star badge and not actual advantages. This means that they can inflate the cost of the E-Class to over $50,000 for its starting model. On the other hand, the 2018 Kia Stinger, in its base configuration, is over $20,000 less than the base E-Class. If top performance and luxury are what you’re after, however, you probably know they cost money. Even at the top trim and capability level, you’ll still save $7,500 with the Stinger, whose MSRP comes in at $51,400 compared to the E 400’s $58,900. MSRP is only half the story for cost, the 2018 Kia Stinger also offers a superior warranty, covering your luxurious sports sedan for 1 year and 10,000 miles more than you’ll get from either of the 2018 Mercedes-Benz E-Class models. The 2018 Kia Stinger is a dynamic and powerful new car, whose exterior, interior and performance capabilities have all been engineered to impress. For more information on the 2018 Kia Stinger or to schedule a test drive, contact us today! Click here for more information on the 2018 Kia Stinger!